Innovative Office Solutions was invited by local business leaders to head up the design of the classroom and, in collaboration with Kimball Office and PBK Architects, started working on concepts and designs. Kimball Office and PBK Architects had partnered together in 2012 on a “Learner Think Tank” project. This research as well as multiple interactions between Kimball Office and PBK, combined with IOS’ leadership and project management, led to the design and, ultimately, the unveiling of the classroom in an official cable-cutting ceremony in August. 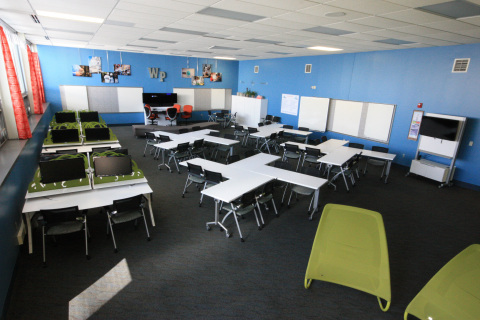 A wide variety of Kimball Office product was used to create an engaging environment conducive to learning, including: Hum, Scenario, Fit, Villa, Beo Lounge, Traxx, Wish, and Priority. Innovative Office Solutions is a full-service dealer that provides furniture and professional interior space planning to corporate, healthcare, educational, hospitality, and government accounts. Located in Maria Stein, Ohio, IOS is a Kimball Office Select Dealer Partner. For additional information, visit www.ios-inc.com. Kimball Office has been transforming workspaces for nearly 45 years with an ever-widening breadth of relevant, sustainable office furniture solutions. As one of America’s most respected environmentally-conscious contract office furniture manufacturers, they provide architects, designers, facility managers, and employers with open plan system solutions, both modern and classic desking, and a range of conference and seating options. The company is a brand unit of Kimball International, Inc., (NASDAQ:KBALB) , a $1.2 billion publicly-traded company headquartered in Jasper, Ind. Learn how Kimball Office is changing workspaces by visiting www.kimballoffice.com. Founded in 1981, PBK is a comprehensive planning and design firm that specializes in architecture, MEP engineering, structural engineering, civil engineering, master planning, technology consulting, exterior building envelope consulting and interior design. The company services clients in the Healthcare, Civil/Public, Higher Ed, K-12 and Sport Facility markets. With more than 150 employees, PBK has offices in Houston, Austin, Dallas, El Paso, Fort Worth, McAllen, San Antonio, Baton Rouge, and Tulsa. For additional information about PBK Architects, visit www.pbk.com. Kimball International, Inc. provides a variety of products from its two business segments: the Electronic Manufacturing Services segment and the Furniture segment. The Electronic Manufacturing Services segment provides engineering, manufacturing, and supply chain services which utilize common production and support capabilities to a variety of industries globally. The Furniture segment provides furniture for the office and hospitality industries sold under the Company’s family of brand names.